When you send your prayers and petitions to the National Shrine of St. Jude, they are incorporated into the Masses, prayers, and good works of the Claretians in Chicago at the National Shrine of St. Jude, and in more than 60 countries around the world. You will be joining a community of well over a million people who share our devotion to St. Jude. We honor St. Jude because he offers comfort and hope to those seeking his help. 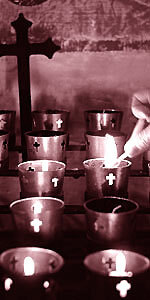 Thousands of devotees write us regularly about how St. Jude has affected their lives. If St. Jude has helped you, please consider sharing that message of hope by supporting the National Shrine of St. Jude.